You wouldn’t have had any bother spotting the first mark today if you were racing in the IRM and IRC classes: it was the one sitting on the deck of a ship. The IRM fleet was the first to arrive at North Ryde Middle channel mark to find that the Queen’s Harbourmaster vessel Salmaid had lifted the buoy out of the water for a full service, forcing the fleet to round astern of her. For those further back, the chaos was worse. As the IRC 3 fleet was rounding Salmaid, she lowered the buoy back into the water and came astern on her stern anchor. Some of the fleet were shut out and forced even further to leeward, while simultaneously a path between the ship’s bow and the buoy opened up for boats behind, allowing them to squeeze out a quick advantage. 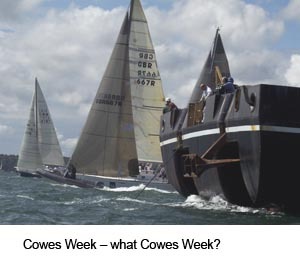 Cowes Combined Clubs liaise with Trinity House, which maintains buoys in the Western Solent, and Queen’s Harbourmaster Portsmouth, which is responsible for most of the buoys in the Eastern Solent. “We would normally have expected QHM Portsmouth to let us know if there was buoy maintenance, but somehow it slipped through the net,” comments Stuart Quarrie, chairman of Cowes Combined Clubs. Quarrie says he hopes that it didn’t prove too confusing or disadvantageous for crews. Any claim for redress, should it arise, would be handled by the protest committee, which would have to decide whether or not the race committee was in error in not knowing that buoy maintenance would affect the courses or if it was outside their control.